438 pages | 228 Color Illus. 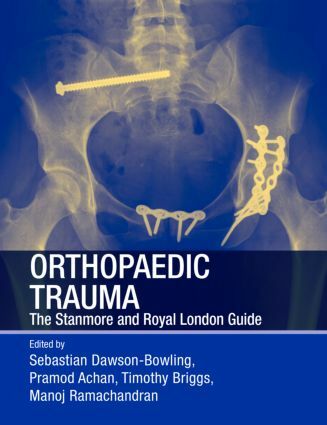 Orthopaedic Trauma: The Stanmore and Royal London Guide is a definitive and practical guide to musculoskeletal trauma surgery with an emphasis on the techniques employed and the reasoning behind them. Written with the needs of trainees in orthopaedic surgery in mind, this comprehensive book systematically covers all aspects of trauma of the upper limb, lower limb, and spine, with separate sections on paediatric trauma. Many chapters include detailed descriptions of the initial diagnosis and management of common injuries as well as the consent process, theatre set-up, and surgical approach required for operative treatment. The book also features sections on topics such as polytrauma, pelvic trauma, and resuscitation, enabling the reader to learn safe, evidence-based approaches. Information on complications, key references, viva and multiple-choice questions to test understanding of concepts covered are included in each chapter, allowing the book to be used both as a practical guide to the treatment of patients and as a preparation tool for postgraduate orthopaedic examinations. This book complements the successful titles Basic Orthopaedic Sciences: The Stanmore Guide and Operative Orthopaedics: The Stanmore Guide. "’The stated aim of the book is to fall between the two extremes of a simplistic pocket handbook and a book focusing on the minutiae aimed at an expert trauma surgeon. It does strike this balance well, providing a practical guide for the trainee surgeon faced with both common and unfamiliar injuries." Sebastian Dawson-Bowling, MA, MSc, LLM,FRCS(Tr&Orth),consultant orthopaedic surgeon, The Royal LondonHospital and Gateway Surgical Centre, BartsHealth NHS Trust, London, UK. Pramod Achan, FRCS, FRCS(Tr&Orth),clinical director of orthopaedic and traumasurgery, Barts Health NHS Trust; honorary senior lecturer, Queen Mary University of London; training programme director, Percival Pott Programme, London, UK. Timothy Briggs, MD(Res), MCh(Orth), FRCS, professor of orthopaedic surgery and joint head of training, Royal National Orthopaedic Hospital, Stanmore, UK. Manoj Ramachandran, BSc(Hons), MBBS(Hons), FRCS(Tr&Orth) consultant orthopaedic and trauma surgeon (paediatric and young adult), CIO and lead for paediatric prthopaedics, The Royal London, St. Bartholomew’s and Barts, and The London Children's Hospitals, Barts Health NHS Trust; and honorary reader, School of Engineering and Material Sciences, Queen Mary University of London, UK.